Do you frequently get colds or the Flu every Winter? While avoiding sick people and washing your hands can help you avoid sickness. Strengthening your immune system is your best defence. 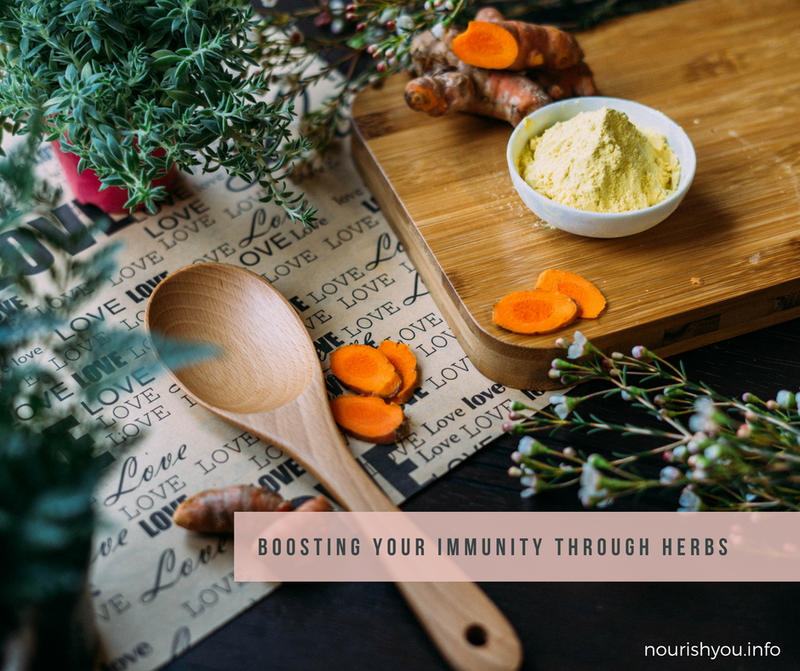 Also including herbs into your every day can be an important part of your immune system support. Herbs can help to strengthen and boost your immune system so that it can do it's complex job well. When our Immune system is not functioning at its full capacity, it can increase the risk of infection. How Do We Know Herbs Can Do that? When learning about plants\herbs, it is important to realise that there is no one way of knowing. We have historical records of plant use going back thousands of years. Then we have today’s herbalist’s using herbs in their lives and their practices and documenting their personal experiences. This historical and current information on herbs coupled with the growing number of scientific studies on plants enables us to get a clearer picture of the many ways that plants/herbs can heal. Herbal theory has an entirely different approach to health, with principles and diagnostics that go beyond this for that. Practitioners commonly referred to this as the art of herbalism it is important to understand that a well-trained herbalist doesn’t treat, diagnose, cure or prescribe herbs for diseases. Instead, herbalism often takes the more personalized approach, choosing herbs for a person rather than simply for a particular ailment. If you were to see a practitioner they would do a thorough examination to get a more precise understanding of who you are. Below is a general overview of how certain herbs can benefit and support your immune system. Astragalus is one of the most popular herbs in traditional Chinese medicine. It's used for a variety of purposes, including strengthening the immune system and preventing upper respiratory infections. Astragalus appears to activate B- and T-cells (essential for immunity) and stimulate macrophage activity (macrophages are white blood cells that locate foreign bodies and "eat" them). Its immune-boosting properties mean that it's commonly used as a preventative treatment against colds and flu, rather than for an acute infection. One of the easiest ways to include this amazing herb in your diet is by using it to make Chai tea. You can also add the root to broth or soup (always remove the root before eating). In China, the dried roots are added to soups for their medicinal benefits. Use astragalus after an illness to boost your immunity. It's not recommended to take during illness as it can aggravate the acute infection. It is recommended that you use large amounts anywhere from 10 to 30 grams per day as they do in traditional Chinese medicine. Make sure you buy Astragalus membranaceus not one of the many other plants in the same genus. Take to prevent colds and the flu, however, avoid it during acute illness. Do not use with autoimmune suppressive drugs. Astragalus is generally safe to use with no serious side effects. There are possible interactions with other herbal supplements, so start with smaller doses to prevent side effects. Women who are pregnant and who are nursing should not use astragalus, as some animal research indicates it may not be safe for pregnant moms. People with autoimmune diseases should speak with their doctors before starting astragalus because of its ability to stimulate the immune system. Individuals with diseases like multiple sclerosis, rheumatoid arthritis and other immune system conditions could be especially sensitive to astragalus. Some specialists suggest only using a specific adaptogen for a few months and then move on to another. Holy basil, also known as tulsi, is revered in Ayurvedic medicine. It's a herb to take on a daily basis for general health and well-being. It's especially useful where stress is present (stress lowers the immune system) as it helps to lower cortisol levels. It also regulates blood sugar. If you are under a lot of stress or going through something particularly emotional – perhaps consistently waking up in the middle of the night – holy basil may be for you. Makes a delicious tea - Steep for 5 – 10 mins. Sip on holy basil tea during the day, or use as a calming tea before bedtime. You can start with one teaspoon of the leaf and increase as desired it will be difficult to take too much of this herb. Holy basil should not be taken when pregnant or breastfeeding. Taken in large doses, it may act as a male contraceptive, it, therefore, should not be used regularly by couples wishing to conceive. One note to keep in mind is that holy basil (tulsi) may slow blood clotting, so taking tulsi along with medications that also slow clotting might increase the chances of bruising and bleeding. Some medications that slow blood clotting include aspirin, clopidogrel, dalteparin, enoxaparin, heparin, ticlopidine and warfarin. Due to its influence on blood clotting, you should discontinue use of holy basil two weeks before any scheduled surgery. Garlic was used in the 1600 against the plague in Europe and during World War 1. Practically every herbal text in the Western world includes references to garlic anti-microbial properties and science has been validating garlic's effects against infections. This is great to have made up and ready to use over the winter months. By combining honey with the garlic it makes it quite palatable. Place the garlic in a glass jar, let it sit for 10-15 mins to allow it to react to oxygen and become even stronger medicine. Put half the honey into the jar. Still well, then add the rest of the honey to the jar. Let the mixture rest for 24 hrs before using. Will keep for ages on the bench or in the fridge in your prefer. Take 1 teaspoon a day as a preventative or during a cold take 1 teaspoon 3 times a day. For a sore throat take 1 teaspoon every 1 -2 hours.